Alpha Sigma Alpha is seeking one collegiate member to serve on the 2018-20 nominating committee. 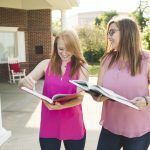 The nominating committee is charged with interviewing women who have the vision, skills and dedication to be the elected leaders of Alpha Sigma Alpha. The work of the 2018-20 committee will culminate in the spring of 2020 when a slate of candidates is finalized. Collegiate women bring an important perspective to the process of slating who will serve on the national council. One collegiate member will be selected for this esteemed role. The member selected to serve will hold the role for approximately one year starting May 2019. How will the collegiate representative be chosen? The current national council will review the collegiate applications, interview top candidates and select one member to serve in this role. The member should be a current undergraduate member not expected to graduate prior to June 2020, be in good standing with her collegiate chapter, have attended multiple national events (i.e. District Day/The Academy, LDI, Convention and/or service immersion), be knowledgeable about Sorority operations and have the ability to maintain strict confidentiality about prospective nominees and the deliberations of the committee. How do I apply and what is the timeline? Interested individuals may fill out the following application below. Applications are due March 22, 2019. National council will make the appointment in May 2019 and work will begin late summer/early fall 2019. Committee members are expected to attend numerous committee calls for training and deliberation as well as interview calls with potential candidates (as many as 25 calls). Each call typically lasts one hour. Committee members also spend time reviewing extensive application materials. Training occurs in the summer months, with the bulk of the application review, interviewing and discussion taking place September through February. Please contact Executive Director Krystal Slivinski with questions. You must be logged into MyASA to see this form.